Apple has launched the Gift Cards promotion for the students in the US, who on purchasing the Apple devices would be getting free gift card credits, and that depends on what was purchased. On purchasing a Mac, get a $100 App Store Gift Card — and also save with education pricing. Or buy an iPad or iPhone and get a $50 card. This Back to School comes every year at the time of school opening, and Apple already provides a certain percentage of discount on the products for the students. These $100 or $50 credits can be redeemed by purchasing content on iTunes, and this includes Mac and iOS apps, movies, television shows, songs, books and more. 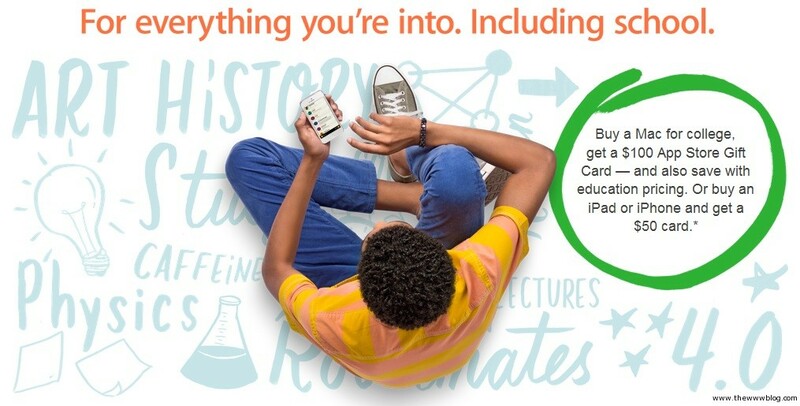 This offer is available through Apple Store for Education where Apple offers special education pricing on Apple computers, software and select third party products to college students, parents buying for a college student, or teachers, homeschool teachers, administrators and staff of all grade levels. Students who have been accepted to college are also eligible. There are a few conditions, like, Mac Mini is not being included in the offer, and that is understandable where Apple is focusing on students with this offer. Thus, the gadgets that are eligible include iPad 2, iPad mini, fourth-generation iPad and iPhone 4/4S/5. But this is the first time that Apple has included the iPhone in the Back to School offer. Austria, Belgium, Canada, Denmark, Finland, France, Germany, Ireland, Italy, Netherlands, Norway, Spain, Sweden, Switzerland, the United Kingdom and United States. Find whether your school is eligible to get the offer – check Apple School Finder. The good thing for the students with Apple is that they get quite a good discount, and for Macs the discount could go to even $200, and moreover, this offer of free gift card helps as students do find some great paid apps which they can get for free with it. The offer is valid from today to September 6th, where the gift cards would be given then and there thus, this can apply as a discount although the students cannot redeem this with direct money.